We bought two large bone-in pork chops during a good sale last week. While covering meat in Cabernet sauce or green peppercorn sauce is delicious and comforting, this recipe screams spring…or maybe it just screams tasty. 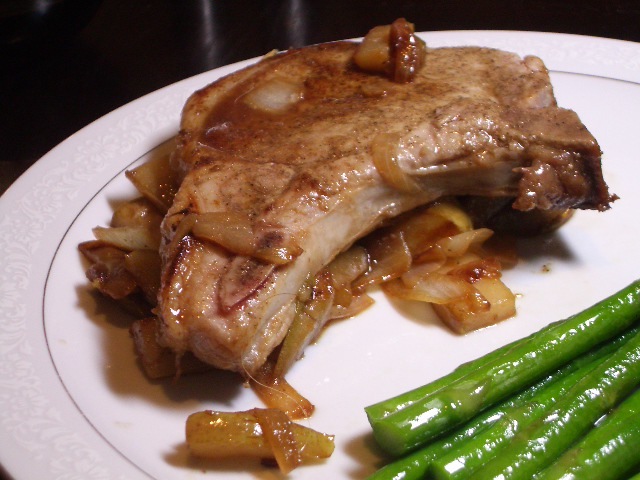 All of this pork/onion/pear business was Gardner’s idea, so I take credit for nothing other than eating it happily. oh, and making asparagus…but that’s easy. We hope everyone has a fabulous weekend – whether you’re celebrating Easter or just enjoying the great weather of late. We’ll be enjoying some nice time with family but will be blogging and tweeting as usual (that’s the hope, atleast). Did you notice that I’ve joined twitter? I know, I’ve gone crazy…but I’m really enjoying it. You can see some recent tweets on the bottom right hand corner of the homepage. Happy weekend! !